My Zeide lost his wife and 4 children in 1944 at the hands of the Nazis yms"h, and started all over again in the DP camps. Upon arriving in America he worked hard, very hard, and even after being robbed blind by a business partner never complained. Today some of those jobs he worked at might not sound so "respectable", especially for a Talmid Chochom, but that wasn't a problem for my Zeide. 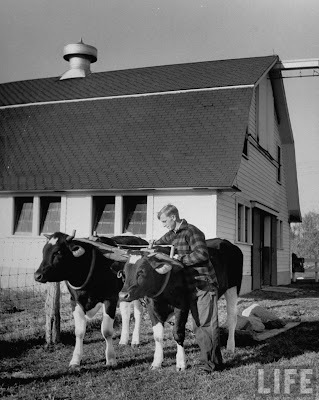 He may have worked to provide for his family, but his eyes and mind were always in a Sefer. He would arise way before dawn to learn and give Shuirim, and was back at the Gemoroh upon returning home. 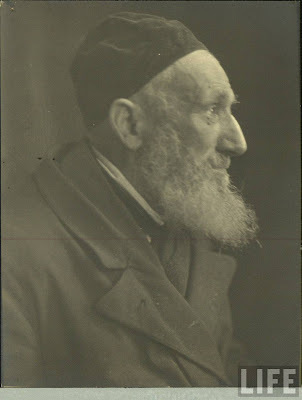 Upon retiring he spent his time in the Bais Medrish. 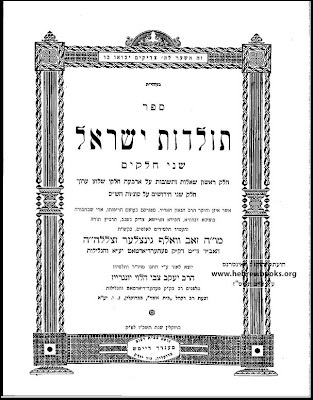 Zeide was a Talmid of the VaYaged Yaakov of Pupa, who passed away in 1941, for a short time, and then, for the most part, a Talmid of Reb Zev Gintzler of Solgotarjan and F'Gyarmat, Hungary. A point about RZG's dedication to his Talmidim, and in turn their love for him, is made by the fact that when RZG was offered the Rabbinic post of F'Gyarmat ALL OF HIS TALMIDIM WENT ALONG WITH HIM TO THE NEW TOWN! The Yeshiva was restarted in his new place of residence. Unlike other Yidden his age and of his background whose children/grandchildren chose to "join" Lubavitch, he would tell people he would meet with me that דאס איז מיין אייניקל, ער איז א ליובאוויטשער חסיד, "די ליובאוויטשער רבי איז געוואלדיג גרויס , That, in a way, gave me the Chizuk I needed during those turbulent times. While bedridden the last few weeks of his life, his lips did not cease to murmur words of Torah and Tefilloh, and he passed on B'Misas Neshikoh on Erev Shabbos Kodesh, 6 Nissan 5754. I wrote most of these words three years ago on his Yohrtzeit, yet they still ring as true as ever now. I thought about him a lot recently, and how his presence is sorely missed. How my own children would've benefited greatly from him and from his old world character. The fact that he had to start all over again basically made an entire generation miss out on learning from him. That is another great tragedy that often gets overlooked when discussing the holocaust; the fact that then you could only enjoy your grandparents when they were elderly. Today you can have a young, vibrant zeide in his 50's teach you and share with you. And bubbe as well, of course. Anyway, I wish I could've made it to the Beis Olam today, and I could have really, it's just that TODAY of all days I FORGOT! The only reason I remembered was because I saw a mention online of the Floral Park cemetery where's buried! I could cry right now. In my travels across cyberspace there was one line that I saw that really hits its mark. 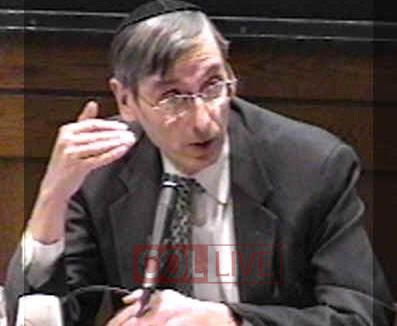 The Kotzker Rebbe zt"l asked a question: Chazal say הבועל ארמית קנאים פוגעין בו, why davka Kanoyim? why shouldn't just anybody do it? The Kotzker gives an answer that Sigmund Freud would be quite proud of: He says that they're there to do the Kanoyus shtick because they hang around there!!! They hang around the Botei Zo--s so they see the thing happening with an Aramis.... Therefore they're the ones to jump in and do the deed. Or you might say that they do it only to throw off any suspicion that they might be soft on vices such as those... I may have mentioned once that the Tzemach Tzedek also alludes to that when he says that Kanoyim in general are often nervous, unhappy, and angry people who happen to have channeled that energy into standing up for G-d and Torah. IOW, Yesudosoy may not be BeHarerei Kodesh after all, it's just their nature. And the fact that others are not as zealous may only be simply because their nature is different; not that they care any less about G-d and Torah. Food for thought. I was thinking about that recently when a recent terrible scandal in the Jewish community was discovered and the monster was sentenced to spend the rest of his life in jail. One of the pictures I saw about the case was a group shot of the man's children who STAND BY THEIR FATHER and blame their mother - now divorced and remarried - for the troubles. Talk about Stockholm Syndrome! The picture was - sorry to say - amusing since the family was what you call frummer than frum. The boys had the longest peyos you have ever seen - never being to cut them, and the girls wore their hair in braids, also never cutting it till they marry. Even amongst the frum ones braids is like far out frum, I'd say maybe 2-3% of Satmar in America and everywhere else outside Meah Shearim wears it like that. The rest are of course very Tzniusdik, but they don't take it that far. 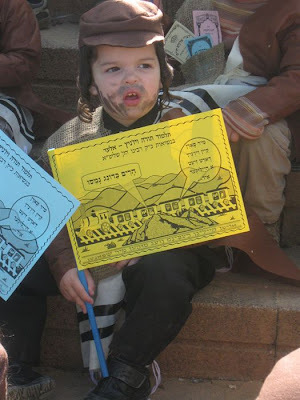 For this guy regular Satmar frum just wasn't good enough; he had to be Rebbishe/Meah Shearim frum. That was probably a giveaway that something was amiss here. What gets me is apparently the woman went to Rabbonim to complain but they wouldn't believe her. After all, the guy was soooo frum! Coming from Beis Nissan the Yoma DeHillula of the Rebbe Rashab of Lubavitch, here are some of my thoughts regarding the man and his mission. 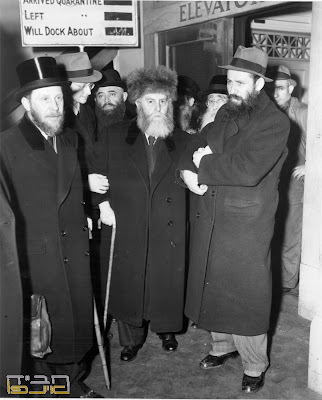 I was watching a farbrengen of 20 Cheshvan, the RR's birthday, where the last Rebbe speaks of the venture of the Rebbe Rashab to save Yiddishkeit by creating the Yeshiva Tomchei Tmimim in Lubavitch in 5657, and how his directives are very pertinent to his Talmidim and Talmidim of the Yeshivah today as well. The Rebbe even is mechayev women as far as that goes. One cannot help but realize how important the Rebbe thought each and every one of us in returning the Jewish nation to its full glory and bringing Moshiach. It didn't matter if you were a pure simpleton, there was something you could teach to a total ignoramus, and you had to do that. 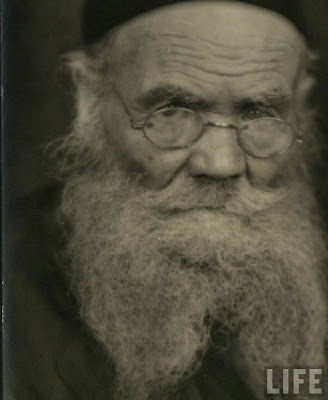 Those of you who have difficulty understanding the derech of Chabad might look at it and see problems, real or imagined ones, and may see it as the brainchild of the Rebbe - not that there's anything c"v wrong with that - but I'll prove that it wasn't so; this was at least 3 generations in the making. 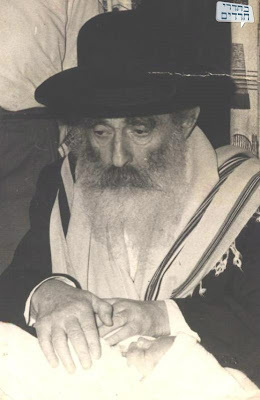 Let's take a look at the Rebbe Rashab. Kodesh Kodoshim Mamesh. Frum vi a misnaged, his own mother called him. A towering man who even the great Geonim amongst the Misngadim had no choice but to have great derech eretz for him and respect his often lone opinions. In 5657/1897, the Rebbe basically decided that he alone will save Yiddishkeit. We all know what kind of destruction the movements of the day were wreaking on Yiddishkeit those years, and the Rebbe wanted to at least put a dent in it. So he decided that he'll start a Yeshivah that would educate bachurim on Mesiras Nefesh and make true Yirei Shomayim, leaders of Klal Yisroel in the years to come. What does that mean, "true Yirei Shomayim?" Well, despite there being several Yeshivos Kedoshos at that time fully operational for decades by then, the Rebbe felt that they were generating Talmidei Chachomim, yes, but not the Yirei Shomayim that he was looking for. In order to produce leaders and true Rabbonim there would need to be a heavy emphasis placed on the learning of Chassidus Chabad. So he went and started his own Yeshivah in the Belorussian backwoods. 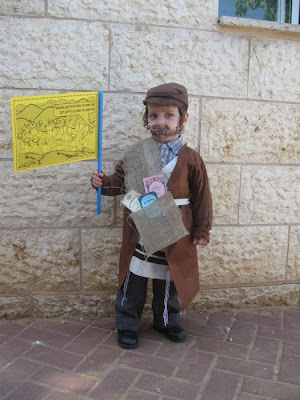 He traveled to see how other Yeshivos operated, but basically did it by himself. He didn't gather the leaders of the generation. He even disagreed with his cousins as to what the true Chabad derech was. HE decided that the few bachurim in his small town will save the world! He traveled to Pressburg to see how they do it there. Faraway Pressburg, not nearby Mir or Telshe or Kelm. I don't know what he took from there. All I know is that he went a long way out of his way. Do you begin to see the parallel already? There's also the idea that not only will he go it alone, but he'll also be the only one to fully understand the needs of the people - all kinds of people - and only his bachurim will get it done. He'll send his bachurimlach to faraway Georgia and Buchara too, despite them being as familiar with those Jews as I am with astronomy. Then, if you'd like, you can follow the next two leaders of Chabad and see what they did and how they did it, and you can see where they got their lessons from. Some idiot sent me a nasty message informing me of the sad news of Reb Elya's death, and suggested that me and others in my community would make seudos and drink mashkeh to "celebrate" the passing of the Rosh Yeshivah. All I can say is: אשרי מי שחושדין אותו ואין בו. Never have I spoken disrespectfully of Rabbonim and Roshei Yeshiva here. So please keep your distorted feelings to yourself, without passing them on to me. We all know that Reb Elya was no lover of Chassidim, I guess he yarshened that from his Rebbe, RAK. Maybe it's me, but that doesn't mean that he had anything but Shem Shomayim in mind. I know of many chassidim who were his talmidim, including Lubavitcher chassidim, and none of them have anything but very fond memories and the greatest respect for him. We can respectfully disagree with him, but nothing further. The American Yeshiva world lost a fearless leader, one who didn't toe the line and made his feelings very clear to all, even when very unpopular even amongst his peers. He will be sorely missed, and has been since he fell ill years ago. Zol er hobben a lichtigen Gan Eyden. The saying goes that there are two things that one needn't see how it's done, war -law, rather, and sausages. We can now safely add to that a third thing: Da'as Teyreh. We can very plainly see how a man about to celebrate his 99th birthday is taken for a ride by two shifty shady characters, while the grandson Aryeh lets it all go down. These men - who I would not trust with my young sons - let alone daughters - came with their perverted ideas all arranged in their greasy heads, and all they wanted was to weasel out the answers that fit their agenda. It's not just me saying this; Read the comments here and see what regular guys think about it. Letters and proclamations that bear Rav Elyashiv's name and signature will never be the same with people who watch the 17 minute clip. For these people there is no G-d, no Torah, no Halochoh, just their perverted minds. And they'll take advantage of anybody to get their way. G-d makes us find things even when we aren't searching for them. Case in point: Friday's trip to the mall. I thought I was buying a Tallis Koton for my son, but the price for a wool size 16 Chabad was over budget. So I went upstairs and looked at books instead. "I'll get it in BP or CH," I said. There's no way I'm paying those prices here. 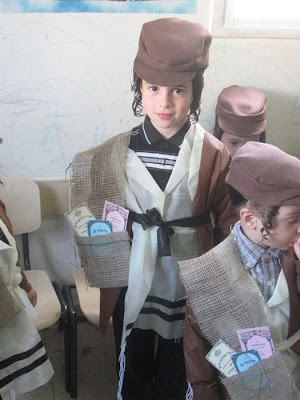 Which may make you wonder: why get a wool Tallis Koton for a little kid when cotton is just as good and children are only mechuyav in chinuch anyway? But we take pride in our devotion to mitzvos, even when we're young, and even in 90+ degrees. 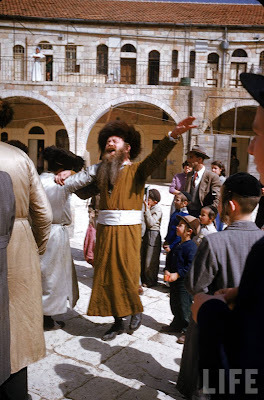 I remember fondly the basketball games in the Yeshivishe camps, where many of the fine the Bnei Torah would play without Tzitzis and I would wear my five pound size 30 extra long wool ones. It instilled in me a pride I wear till this very day. 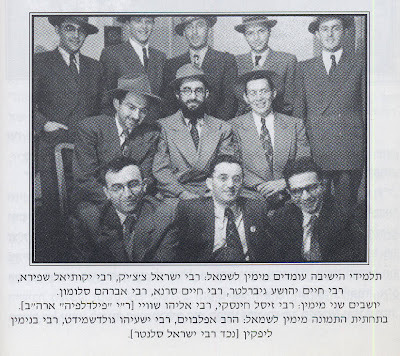 That I was part of a very unique and devoted group, one that took pride in its traditions and in its devotion to Hashem and his mitzvos. Back to the books. I was looking for something good to read. A friend had recommended the biography on Reb Aron Cohen, the Rosh Yeshiva of Chevroner Yeshivah in Geulah who was prematurely taken from us many years ago while still in his prime. He told me there were some really good pictures, you know, ones that Chassidim laugh at and wonder why they didn't censor them. I figured I had seen them all by now, whether in the biography of Reb Simcha Zissel Broyde, or in Reb Meir (Paritcher) Chodosh's biography, so when I didn't see it I wasn't disappointed, I just looked for something else to buy. Nothing else really piqued my interest; it was more of the same old stuff. Until a little book caught my eye. Could it be? That here in this store that doesn't sell Uncle Moishy DVDs, and chooses its Chabad books very carefully, that they would have a book of this caliber?! I checked the author's name again, and checked the title. There was no mistake, it was THE book! 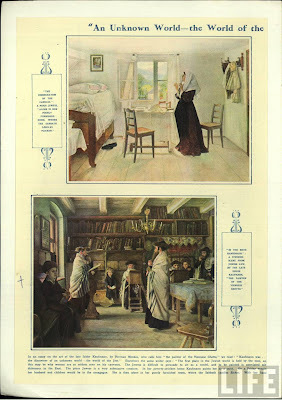 No, I'm talking about MOAG, I'm talking about שוחרי השם בהרי הקרפטים, by Dezso Schoen, aka דוד שן, who survived the Ghettos and deportations and made it to Israel. The book is controversial because it tells it like it was when it came to Hungary/Carpathia and the goings on there from the time of the Yismach Moshe to the time it ended well over 100 years later. 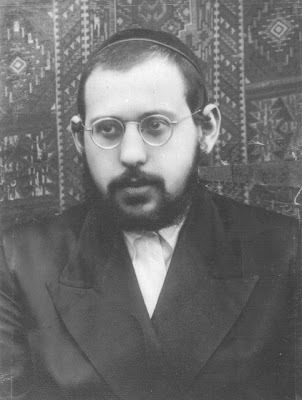 It gives you a very colorful description of his attachment to Chassidus, how it was a "forced" visit to the Chozeh of Lublin that got him involved in the first place. How the dayan in Ujhel accused him in a sefer that the YM gave an Haskomoh to of being a corrupt, money hungry Rov, who despite once being a Torah giant in Galicia sold his soul to the כת and became a shyster who sells amulets to the unknowing masses. The "taynes" are all there, the late davening, the abandonment of Gemoroh for Kabbalah, the excessive drinking. It's the same thing, only played by different characters in a different period. Nothing can be more reassuring than that in today's world where clueless people think they're standing up for Torah when they attack me and my Rebbe. It seems like you have time for everything else but writing for the blog. It seems like you can't conjugate a sentence when it comes to the blog. It seems like you've had enough, like nobody cares anyway and like there's no point in sitting here and moderating comments that you don't agree with half the time. It seems like nobody cares, since nobody asked you why you haven't been writing. OK, I take that back, two people asked me. But still, I know I'll be back soon with my energy and confidence restored. In a possible fit of Hashgachah Protis, a scholar named Rachel Elior has just dredged up the waters of the Essenes. Her radical conclusion – that the Essenes never existed, that they are a production of Philo’s wishful thinking – is best discussed among scholars. Her scholarship reminds us of one relevant point. The Essenes were never mentioned by Chazal. We don’t know why the Essenes separated. We don’t know if the Essenes separated. Apparently, we aren’t even certain they existed. We are certain that Chazal never “frowned upon these people,” among his other inaccuracies. Perhaps Mr. Maryles is so confounded by his intense dislike for Charedim and his need to pound the drumbeat of “they are isolationist!” that he missed this inaccuracy in his thought process. From the concept of a Seyag, a fence for Torah, to the admonition of the Rambam to retreat to an island if all humanity fails, to the walls erected around G-d-fearing European communities against the Maskilim, isolationism works. Perhaps Mr. Maryles means to refer to Bedidus Besoch Bnei Odom, to remaining walled off while walking among the masses. The goal is then not to participate in the world, but to allow the world to participate in you. You are not affected by the world; the world is affected by you. There is room for discussion of the cynicism and materialism pervasive in the Jewish world. The lack of Yiras Shomayim, a staple to be being a Jew when you think no one is looking, is appalling. Return the straw man and illogical argument of isolationism to its proper place on the back shelf. 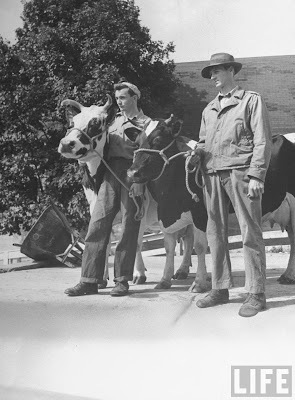 Straw man because no one is truly isolationist in thought or deed, and illogical because isolationism always had and will always have its place in Judaism – the problem lies elsewhere, perhaps in the prophetic words of Chazal that as Moshiach approaches, Chutzpah will increase. Perhaps, as is the case with the Essenes according to Rachel Elior, Mr. Maryles creates the Isolationist-Chasidic-Essene in his mind in his search for Utopia. 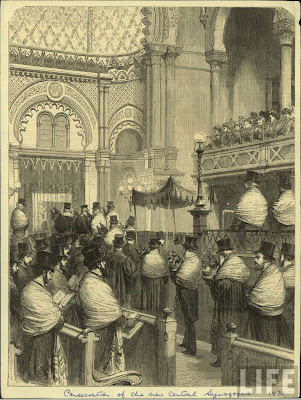 The wonderful place that will allow for participation in the world, a complete secular education yet complete Jewish G-d-fearing education, a complete involvement in the world yet remaining utterly unaffected, or perhaps even a Utopian yes-beard-no-beard solution (skin patch on top of beard, anyone?) may have affected Philo with the dream of the Essenes, and seems to have affected Mr. Maryles with incoherent thoughts that lead to a Jewish Dystopia. 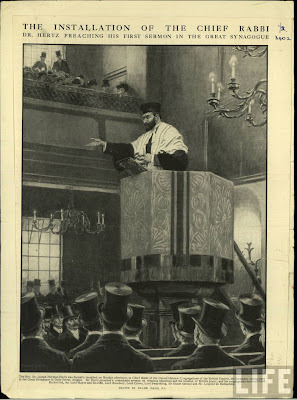 of Dr. David Berger's recent lecture in Manhattan where he spoke about his favorite topic: Lubavitch and the heretics they are. Some Lubavitchers even bothered to attend the lecture, which I don't get. Maybe they figured that they could convince the listeners there that he's wrong? Don't they know that it looks like they have something to hide if they come to shout him down or confront him? The crowd was apparently 95% irreligious people who had no idea what the sources he was quoting mean or say, and frankly don't care. I guess they were there to support YIVO and the Y, and maybe pass the time... But why did Berger bother with these people, did he give up the good fight when it pertains to the Orthodox? Is the indifference on their part too great to overcome? Is he the only one that sees it that way?! It seems like some well-meaning guy who never encountered opposition to Lubavitch asked the following question: "Dr. Berger, would you eat from the Holtzberg's shechitah?" I guess he figured that Berger would have no choice but to answer yes, so as not to sound non-sympathetic to their murder. Anyway, the friend, who has a love/hate relationship with Lubavitch writes to me that the fact that they "played the Holtzberg card" is cheap. Lubavitchers - who often don't know better - resort to that question when confronted: "If you were stranded for Shabbos in Bangkok, would you not eat and daven at Chabad?" But most often pulling out that card is also not necessary. In this case, however, I believe it was well within the boundaries of good taste to use Gavriel Holtzberg's name, and IIMSSM, I'd say that Gavriel Hy"D would be proud. The reason is simple: Part of Berger's crusade is to ban Lubavitcher Shechitah and to make people aware that since Lubavitchers are disproportionate Shochtim that they refrain from eating meat that they know was slaughtered by a Lubavitcher, since ALL Lubavitchers are closest Meshichisten/Elokisten/Kristen in his book. Pretty damning stuff. Like the old saying goes: "trust nobody, suspect everybody." It's a shame that the old age of innocence is over. Truth is I fargin everybody his extra day of shtraymel/bekishe wearing. Why wouldn't I? If I don't I sound hateful, and that's one thing I'm trying to avoid like di Kadooches. At least somebody remembers that it's Shushan Purim af der velt, even if it is the unemployed. A Chassidisher Yid once explained to me why the Chagas Chassidim are so into Bigdei Shabbos at every ocassion: he says that it follows the give and take of Rotzo and Shuv. Bigdei Shabbos is an expression of wanting to be closer to Hashem, he says. 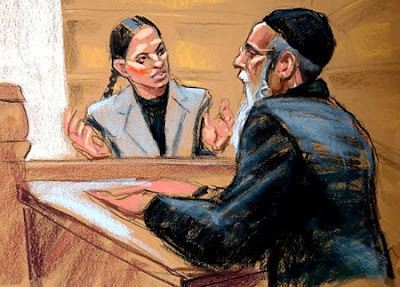 The Chagas Chossid puts on his Shmone Begodim, with the Rezhvulke on top of it all, and he feels a tefach hecher, (like when the Chabad chossid learns a Maamar Chassidus, I would say.) He feels like he's done whatever it takes to be a vessel for the holy shechinah. 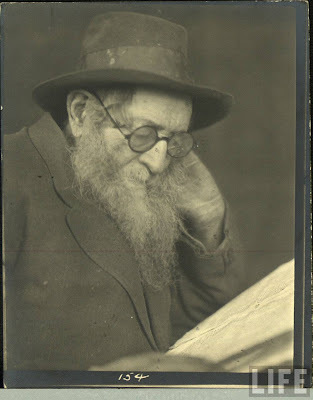 The Chabadnik, with his Oysgedroshene Kapote and smashed hat can't get that feeling. It's just doesn't happen. That's why those feelings don't come as easily for the poor guy. Which is why he has nisht kan Olam Hazeh un nisht kan Olam Haboh. A Megilla reading in front of 1414 President Street in Crown Heights for a Jewish cop on duty. 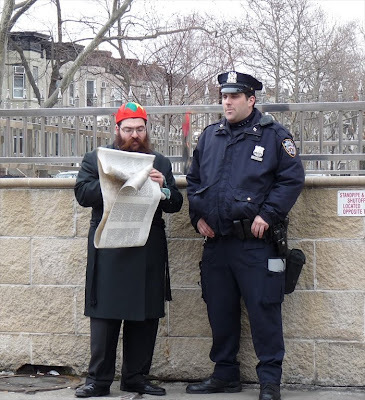 A Lubavitcher Chossid, dressed in his Shabbos finery save for festive headgear, takes the time to read the Megillah for a lone cop on duty during Purim. On the street. That's right, instead of delievring more and more Mishloach Manos to people who could care less if he brings them wine and a piece of cake he tips the scale in our favor by filling the world with one more Mitzvah. The Kaliver Rebbe of Williamsburg travels the world at his own expense, counseling people and helping them in their times of need. When I say the world, I mean The world. The most remote corners of the world. he travels to places that hardly ever see a Gutter Yid; mostly places with small Sefardi communities. He never asks for or accepts money; all he does is speak and give chizuk. They say he made his money from British Real Estate, and is a very rich man, ba"h. Yet, despite his travels and his Baal Shem Tov like activities they say he's what you'd call very "Farchnyokt" in his personal life, making very Rebbishe shidduchim with his children. We need such leaders today. It's tough to call him a leader when his sphere of influence is so small among Jews. Or is it? is he less important than the Rosh Yeshivah in NJ with a school for 30 guys, who tells us not to eat the vegetable of the day? I don't know. I would say he's no less important, and I think you'd all agree with me on that. What I find is that they like to live in both worlds. They want the attention from the frummies, they want us never to judge them, to accept them, and never to make them feel uncomfortable, c"v. We need to let them have their "good times," and then, when they get a little tired of all that "fun," to have a table decked in white with Challahs and wine waiting for them. Why? because. Just "because." Otherwise we're all Nazis. After all, we're the ones that made them into what they became, so we need to make them all better too. What can I say? I would feel a bit used if that were to happen to me. If I had a child or friend that acted that way, after a while I'd get a little tired of his act and demand some sort of consistency from him or her. Either you behave in a way that leaves us somewhat comfortable, or don't expect only love and open arms from us. It's human nature; give and take. If you don't pitch in don't expect to get something for your non-efforts. Nobody likes a louse, a moocher, a do-nothing. In any culture. Now, if we're to believe this kid Finkelstein he was molested as a child. That's what he seems to write in his "suicide note." I don't claim to know what it's like, nor do I judge him for what he did. But my G-d, if this is the case now, if every kid that goes off the derech will now claim that he was abused as a child and will eventually take his own life, can we sit idly by and do nothing? On the other hand; I would assume that most of these kids wouldn't want well-meaning strangers approaching them on the street, asking them if they were hurt as a child, and offering counseling, right? So what do they want? If they know who did it to them, let them go and tell the authorities. Work to extend the SOL for these crimes. Do what must be done. There are Rabbonim out there who are willing and able to help. The subject is becoming less and less taboo by the day. 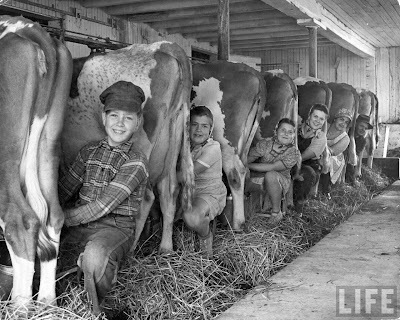 But please, my dear cows, don't stick to your drugs and your other vices and expect help if you won't allow yourselves to be helped. Don't accuse us of being "murderers" and then want help and love from us. We have feelings too. Nobody likes to have his offers for help be rejected time and time again. After a while we just stop helping. I've often wondered why I spend all this time doing something I don't enjoy and for the pittance that it provides. I'm talking about my real job, not the blog. Yoely seems to agree with me. I'm in good company. 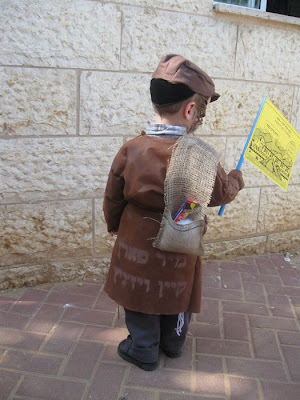 Tzurick in Cheyder/Kollel, depending what age you'd like to be again. These guys like the Geyle Bus stage, and I'm cool with that. It was also filmed in Monsey, right in my backyard. The attention to detail is what gets me, from the silly hats with the flaps we used to wear, they were "chassidish," to the pushing in line, to the sleepy kid twitching his nose. (I understand those hats have recently made a comeback!) I'm glad we're tapping into a pool of real talent with Yoely and his friends. Just a few years ago there would be no way these guys would wear their real faces to do a music video like this. Why, even for a silly Chol Hamoed play these guys would wear six inches of makeup for fear of being recognized, and now they have no problem doing this! To quote a typical VIN commenter: Mi KeAmcho Yisroel!